It’s been a fun experience to watch the circle of life at my ponds each year. Spring usually brings adult frogs with many songs while seeking mates. 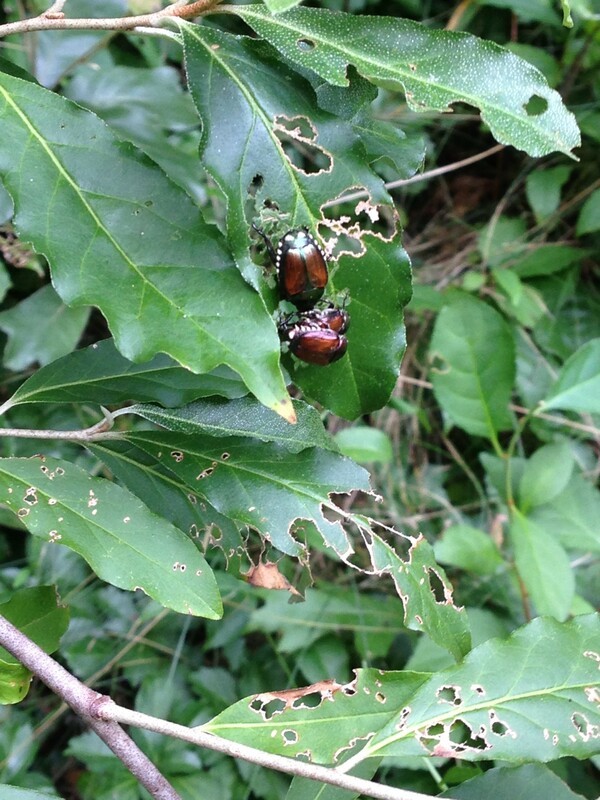 Once they’ve found a mate, frog eggs appear over and over throughout the Spring, Summer and Fall seasons. 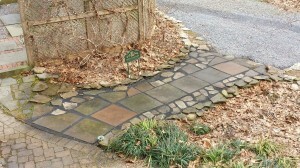 My most “prolific” frog-bearing pond is my whiskey barrel pond. Void of fish, there are no “predator” inhabitants to consume the frog eggs in my whiskey barrel pond. 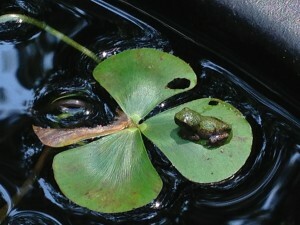 Frog eggs are eaten by many predators, including fish, raccoons, foxes, and other wild pond visitors. 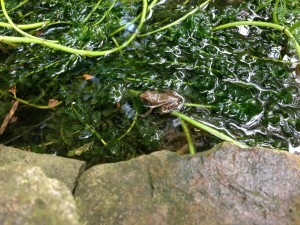 This year, I’ve had quite a number of frogs and toads hatching and moving on to other areas of my garden. 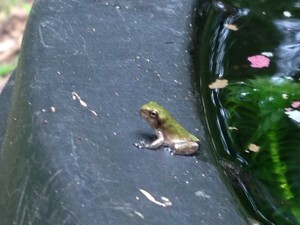 Here’s the first of the tiny frogs that I was able to capture while emerging from my whiskey barrel water garden. And here he/she is again perching on a leaf — clearly taking charge of this pond, surveying the land and water. Really cute. 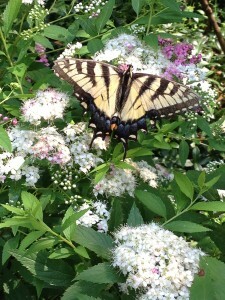 And relaxing on a four-leaf-clover plant while waiting for mosquitoes to stop by. There are quite a few tadpoles swimming around in the pond, too. Tree frogs are plentiful in my garden. They like to hang around our hot tub in the cooler days. They’re cute, but not when they are leaving droppings in the tub and around its edges. And they have a very shrill “chirp” that can annoy even the most acceptable of human ears. 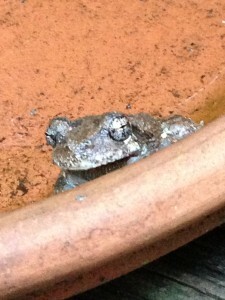 This one below was peeking at me from a plant saucer that I’d emptied of water earlier. 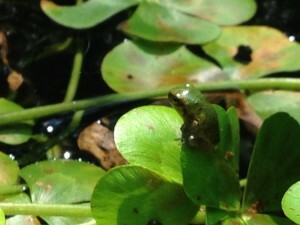 I featured this little frog below in my previous posting entitled Frogs at the Ponds. He has since lost his little tail that he had grown as a tadpole. He’s located in one of my larger ponds. 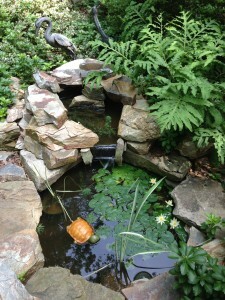 I wanted to show you an update of my front pond redesign — A Water Gardening Remake!. 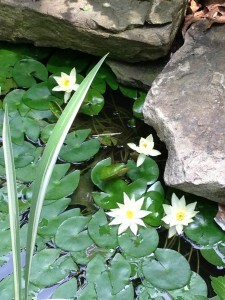 The water lilies are blooming! There are four comet goldfish in the pond that overwintered successfully from last year, and there are 3 frogs hanging around as well. 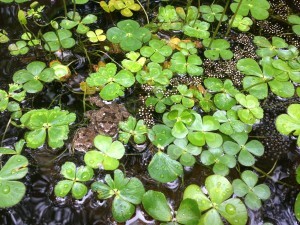 The frog eggs were deposited several times in the top part of the pond, yet a creature keeps coming by and eating them. So no tadpoles for this pond so far this year. I did see a tiny fish a few weeks ago in this pond…time will tell if it survived. And here’s a nice close-up of the water lily plant. The water lily successfully overwintered in the pond this winter. 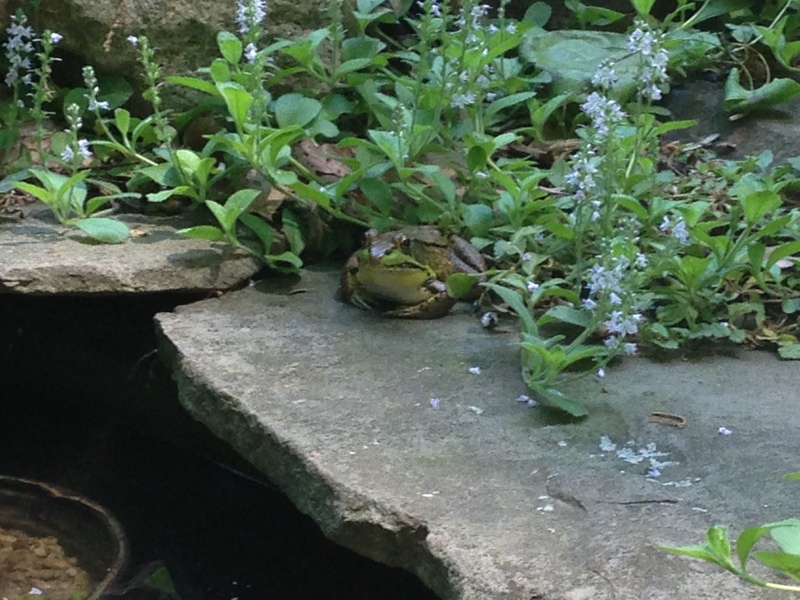 Do you have frogs and toads in your yard this summer? 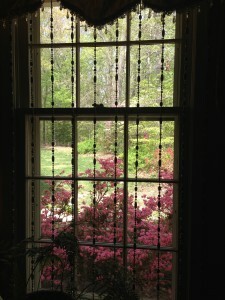 Leave me a comment and let me know!